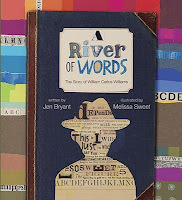 A River of Words: The Story of William Carlos Williams is a hard book to classify. Is it a poetry book with additional background information about the poet for older readers? Is it a story book for younger readers featuring an introduction to poetry? Or should we just give it to the art teachers? The endpapers feature some famous Williams poems. There's The Red Wheelbarrow we've all come to know and love and This is Just to Say, recently featured in a picture book of the same name. Older readers, once familiar with the poems, may enjoy learning about the author, and no doubt will appreciate the simpler text after tackling poetry in class. Younger readers will enjoy learning about the young man who enjoyed playing outside and staying outside. They'll like the boy who raced everywhere, always in a hurry, but would slow down to enjoy the sound and rhythm of the poetry read aloud by his teacher, while images played across his imagination. How that boy decided he could write poetry too, all about ordinary things in his life. (And why can't you?) How that boy, now a young man, became a doctor, but no matter what, continued writing poetry. Art teachers will find plenty (and pardon my artistic ignorance if it is glaringly obvious). 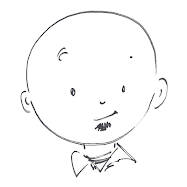 There are watercolor illustrations of Williams throughout his life. There are also collages, many of them featuring words and lines from poems, and many containing objects from the poet's life at the time. There are pages from medical books, notebook paper, the spine of an art textbook, newspapers, pages from a spelling book, and a report card all included in the pictures. Art teachers, are there some potential lessons there? Jen Bryant's book and Melissa Sweet's illustrations fit in many categories, but instead of trying to find all the proper classifications, it's nice to have this simple one: Caldecott Books.